Store everything in this easy stow and go unit. Toss this rigid container in the back of the truck with no worries about the weather or wear and tear. All your hunting items will be fresh and ready for your next hunting Excursion when you arrive. 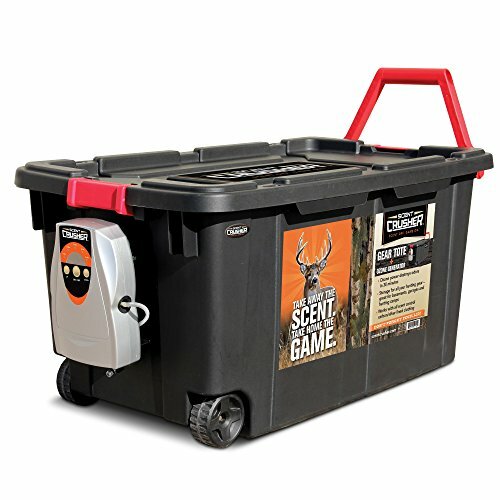 The Scent Crusher is a heavy duty 40 gal. Container that can be used for permanent storage or for traveling. Constructed from polypropylene and polyethylene that is even safe for food storage! features: - oversized handles with lid and wheels - includes 12V adapter and 110V charger - airport/TSA compliant - maintenance free digital Ozone generator included. Specifications: - Ozone tote: 35" L x 21" W x 18".